Please be sure when selecting a fairlead for this Mini 9.5cti, you be aware of which bumper your using. 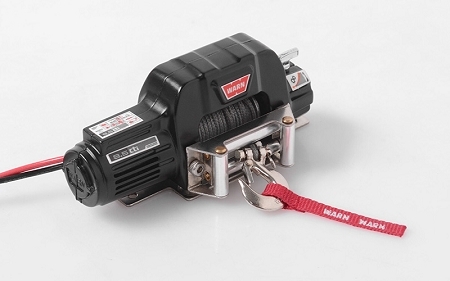 This smaller winch is a great addition to the Warn winch offerings. I have a scale rig with custom tube-work that has a small front bumper. The larger winches wouldn't fit properly in this application. This mini fits perfectly. It has the same performance as the larger version I had shoe-horned in the rig before. The rig I use this version on is a rather heavy hardbody scale rig with lots of tube-work and full interior. This winch hasn't let me down yet. I replaced the line with some braided fishing line so I could get more line on the spool. I was disappointed that the optional (available separately) Hawse fairleads didn't fit this winch - the main housing is smaller thus needing a smaller fairlead. No worries because the included roller fairlead works just fine. I really like the included winch hook with the clip. I find it is helpful during comps with keeping the land anchor/pull-pal attached to the winch line without worry of detaching. This winch may be better suited for you to gain more scale detail with your build as it is smaller and fits in tighter spaces. Highly recommended. Perfect little winch for all the big jobs. Installed this mini Warn on my new LWB hilux 4 door and it works great. My rig is now just over 4kg and this little monster winch has no problem pulling it out when needed. The quality is just outstanding. 100% thumbs up for me. Good job RC4WD!